On Wednesday evening I headed down to the city of Cerritos to see my friend Mark Pulido get sworn in as member of their city council. He was elected in the March 8 election, where he was one of seven candidates vying for three seats in the at-large council. Not only did he win one of the seats, but he garnered 5,198 votes (from an estimated 10,097 voters, a city election turnout of 32.9 percent), making him not only the top vote-getter in this election, but of all time in Cerritos election history. 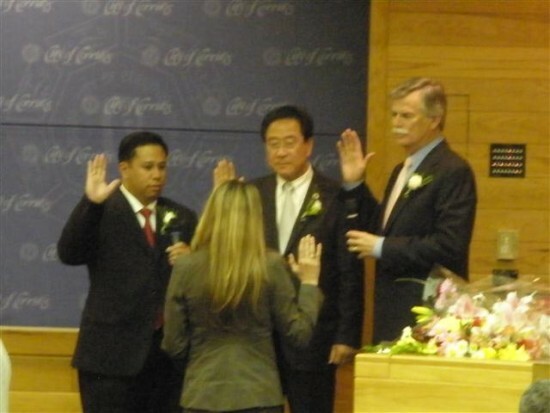 Pulido (left) takes the oath alongside re-elected councilmembers Joseph Cho and Bruce Barrows. 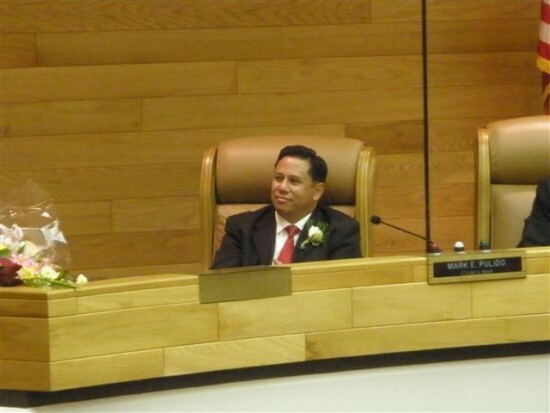 Pulido also made history as the first Cerritos City Councilmember of Filipino descent. Over half of the city’s population of 55,000 is of Asian ancestry, and Filipinos alone comprise 11% (2000 census figure) of the total population and have established a prominent business presence in the city. 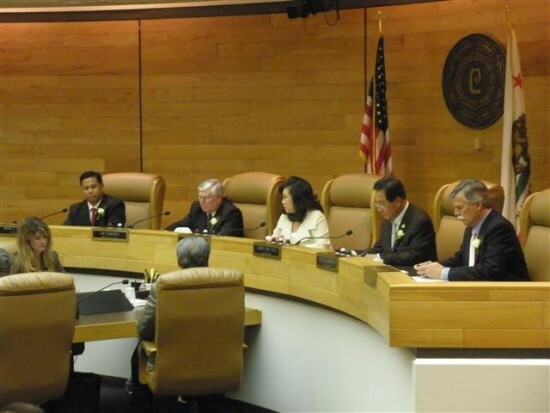 The five-member city council has three members of Asian descent, the remaining two are white. According to Pat Simbol, a Cerritos native and mutual friend of Mark and I, eight Filipinos (“From our parents’ generation,” he commented) ran unsuccessfully for the council in the past. “It took someone from our generation to finally make it,” Simbol added. Pulido himself made two previous unsuccessful runs for the council (though both were special elections where only one seat was up for grabs) before reigning victorious last week. Though I was unable to vote for my friend, I did show my support by donating to his campaign. I also tried to facilitate the endorsement of a prominent Los Angeles elected official for Pulido, which didn’t get to materialize, but judging from the final tally, it wasn’t even needed after all. A packed house of dignitaries, friends and family filled the council chambers. 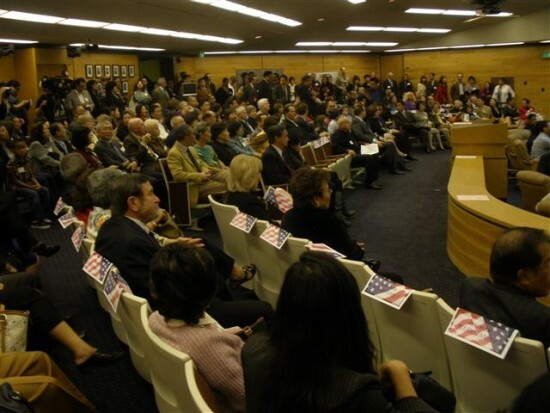 A full house of family, friends, supporters, neighboring city dignitaries and County supervisor Don Knabe packed the council chambers to witness, Pulido finally took the oath of office alongside re-elected councilmembers Joseph Cho and Bruce Barrows. The three were sworn-in by city clerk Vida Barone. After a couple quick photo-ops, he walked up to the concave table and took the seat vacated by termed-out councilmember and Mayor Pro Tem Laura Lee. Lee was also commended for her eight years of city service in the form of speeches, tributes and the presentation of certificates (which took all of an hour and a half). The special council meeting also featured the handover of the mayor’s position from Cho to Carol Chen, who gets to preside over the council and represent the city as its mayor for one year. In one of his last acts as mayor, Cho, who was born in Japan to Korean laborer parents, dedicated a moment of silence to the victims of the recent earthquake and tsunami. He also mentioned, in his farewell speech as mayor, that he will be running in this Sunday’s Honda Los Angeles Marathon in honor of the Japanese disaster victims. As the newest member of the Cerritos City Council, Pulido gave a gracious and gratitude-filled 18-minute speech which thanked literally everyone by name who was instrumental in getting him to the seat which he was now sitting on. After a three-hour council meeting dedicated to ceremony and formalities, there was a reception across the street at the Cerritos Center for the Performing Arts, where elected officials and invited guests were treated to a tasty buffet of sandwiches, pastries, desserts, salads and hors d’oeuvres. Cerritos city politics never tasted so delicious. Or maybe I was just that hungry. Nevertheless, it was a time to take pictures, chat with friends and associates and network. It was also a time to simply enjoy and celebrate the functions of democracy. And now, the real work begins, dealing with issues like redevelopment, infrastructure, quality of life and the ubiquitous budget crisis. Pulido’s first official city council meeting will be on March 24. Best wishes and best of luck, Mark. I’m so proud of you, man.